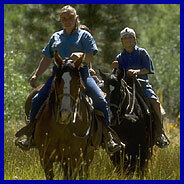 The Junior Ropes Course is for little guys and gals who enjoy big excitement. Located near the Climbing Rock, this program provides the opportunity for children, with their parent's assistance, to challenge themselves on the junior version of the Zip Line and two other Cable Crossings. People of all ages and abilitie smay challenge themselves on the massive outdoor, 25' high, granite-like, multi-faced climbing wall. The climbing wall is open for participants to try just one climb or to spend the day attempting many different routes. The trained staff will teach participants the skills needed to safely belay their climbing partners using arpe and belay device, and are always close at hand to supervise and offer encouragement. The land navigation course combines the enjoyment of hiking with the thrill of exploration. Small group instruction in the use of custom orienteering maps, compass reading and pace setting techniques, prepare you to explore on your own. 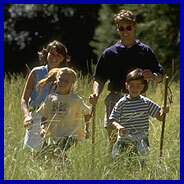 Discover hidden control markers as you navigate through forests and meadows. Orienteering parograms typically last 2 to 3 hours. Another convenience for guests is Northstar's licenced Child Care Center, Minor's Camp, for children ages 2 - 10. Open Monday through Saturday, the Center's experienced personnel will create a stimulating environment that will fascinate your child all day long. Call (530)562-2278 for reservations and information.